The industrial interest in ultrasonic processing has revived during recent years because ultrasonic technology may represent a flexible “green” alternative for more energy efficient processes. A challenge in the application of high-intensity ultrasound to industrial processing is the design and development of specific power ultrasonic systems for large scale operation. In the area of ultrasonic processing in fluid and multiphase media the development of a new family of power generators with extensive radiating surfaces has significantly contributed to the implementation at industrial scale of several applications in sectors such as the food industry, environment, and manufacturing. Part one covers fundamentals of nonlinear propagation of ultrasonic waves in fluids and solids. 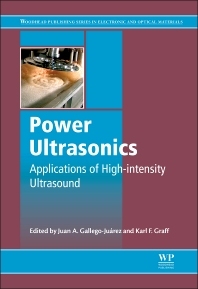 It also discusses the materials and designs of power ultrasonic transducers and devices. Part two looks at applications of high power ultrasound in materials engineering and mechanical engineering, food processing technology, environmental monitoring and remediation and industrial and chemical processing (including pharmaceuticals), medicine and biotechnology. Covers the fundamentals of nonlinear propagation of ultrasonic waves in fluids and solids. Discusses the materials and designs of power ultrasonic transducers and devices. Considers state-of-the-art power sonic applications across a wide range of industries. This book will be an invaluable reference for graduate students and researchers working on the physics of acoustics, sound and ultrasound, sonochemistry, acoustic engineering and industrial process technology, and for R&D managers, production and biomedical engineers. Juan A. Gallego-Juárez, Research Professor at the Higher Council for Scientific Research of Spain (CSIC). Karl Graff, Senior Engineer at EWI and Professor Emeritus, The Ohio State University, USA.